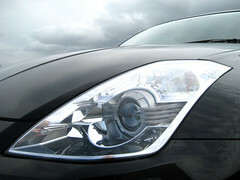 Original equipment headlight bulbs: the facts. A headlight bulb is a headlight bulb. But is it? Whilst they may all look quite similar, it’s the technology inside that you can’t see that determines how well it performs. For example, how much light it will emit, the quality of the beam pattern and the longevity. In many ways bulbs are like batteries; they are available in numerous different sizes/fittings and you can’t tell how good they are by looking at them. However, you know that when you choose a quality battery brand, such as Duracell, that you’re much more likely to get better results than if you chose an unbranded, anonymous type. There are a limited number of original equipment manufacturers who produce car headlight bulbs for vehicle manufacturers. In fact this is limited to just three; Philips, OSRAM and GE. These are the only companies who produce bulbs in their own factories and have contracts with the leading car manufacturers. Manufacturers like Philips and OSRAM invest thousands of Euros each year in research and development. The result is tried and tested performance. In the last five years, OSRAM and Philips have both consistently won ‘Best Buy’ awards in Auto Express’ bulb tests. Because the bulbs are made in the manufacturers’ own factories, you can be assured that if you buy the same product a few years later, you’re actually getting the same bulb. Other brands import their bulbs from other suppliers, so there’s nothing to stop them changing suppliers at any time. You may be buying the same box, but a completely different bulb. Philips and OSRAM are contracted by the world’s leading vehicle manufacturers. As a result, they have to maintain the highest levels of quality. Buying original equipment ensures you’re buying a product that has been well tested to both perform and offer durability. Your headlights are one of the most important safety features you have on your vehicle. Investing in upgrade bulbs has many benefits, such as reducing the risk of accidents and improving driver comfort, but to obtain the very best performance, reliability and value for money, always choose an original equipment supplier, such as Philips or OSRAM.